A superhero costume doesn't necessarily make or break a blockbuster movie, but that doesn't mean it can't turn fans away - or even win skeptics over to the filmmakers' side. That's clearly what the minds behind Batman V Superman: Dawn of Justice are counting on, having recently revealed the brand new Batsuit years ahead of the film's opening. But when it comes to the costume conceived to bring Wonder Woman to the big screen, the stakes are even higher. There was never a question that Batman was a potent enough brand to bring audiences to theaters - even if Ben Affleck's casting earned mixed reactions - so the decision to bring his comic book look to life more faithfully than in previous films was never a make-or-break proposition. Yet, when it comes to the princess of the Amazons, the feat isn't so easy. But we think we have a sense of what fans should expect to see; both from Wonder Woman's duds, and the apparent "tweaks" to Superman's suit, as well. NONE OF THIS CONFIRMED, it's just our prediction based on what we know at this point. Take it or leave it. It seems like just yesterday that fans were debating whether we would see Wonder Woman in the Man of Steel sequel (although Warner Bros. apparently doesn't view it as a such anymore), but now the facts are undisputed: Wonder Woman will appear in BVS:DOJ and beyond, and has been given a costume that the filmmakers deem "relevant for today's audiences." In other words: if it wasn't clear already, short-shorts and a tube top aren't what we're likely to see. Thor: The Dark World actress Jaimie Alexander (herself a former fan-favorite and rumored contender for the role of Wonder Woman) said it best when explaining that for the women - and hopefully, men - of the comic book world, interesting female superheroes have more to offer than their physique. Her character in Marvel's films is a prime example, as 'Lady Sif' managed to be portrayed onscreen covered from neck to knees without sacrificing any of her significance. It's true that some will never be pleased unless DC Comics' most iconic heroine appeared alongside Henry Cavill and Ben Affleck almost spilling out of her top, but Zack Snyder has shown enough for us to know that's likely not what we'll be getting. Another damning piece of evidence came a year ago, when a Wonder Woman short film brought the heroine to life with her original costume mostly intact; it was plain to see that a faithful translation to live-action was a recipe for disaster. We noted then that the best course of action for Warner Bros. would be to take a closer look at some alternative, updated designs from the past decade - be it in comics, or elsewhere (such as the Injustice video game design). It's safe to say that even devoted fans would be willing to concede that granting Diana actual leather bracers (as opposed to bullet-deflecting metal bracelets) fits well with the Amazonian mythology expected to shape her backstory - now that we know the Kryptonian origin story was just a rumor. But the easy decisions stop there. It doesn't take more than a passing glance to realize that while the swimsuit bottoms and corset may have flown just fine fifty years ago, the same just isn't true now. Within the pages of the comic books, Wonder Woman may still be portrayed with plenty of skin, but the public image of the character has drastically changed. For example, observe the images below, taken from the Injustice: Gods Among Us video game, DC's New 52 relaunch promotional artwork, and the most recent animated feature, Justice League War. It's true that comic book enthusiasts have had half a century to realize that skimpy outfits are par for the course in regards to comic book women, but to market their products to non-traditional (read: mainstream) consumers, Warner Bros. and DC seem to have realized that a half-naked Wonder Woman is no longer a suitable treatment. In the case of animated features, the decision to clothe Diana is an obvious one (after all, Warner Bros. wants to sell Wonder Woman Halloween costumes to young girls without shocking their parents). But there's no such obvious explanation for why a violent video game featured a Wonder Woman dressing conservatively, compared to the 'classic' costume. The decision to put Diana in pants - and then return to the bare legs of old - caused some controversy at DC (that is a discussion for another day); but one fact is clear: the publisher is making efforts to get fans focusing on Diana's character, not the amount of skin her costume reveals. In the case of the Justice League: War re-design of the character, the subtext seems to be a desire to give Wonder Woman a suit more similar to the likes of Superman's Kryptonian garb and Batman's technical outfit. If Zack Snyder simply adopted the bare-armed uniform into the same world of mysterious fabrics that seem to be used for both the new Man of Steel and older Dark Knight, Batman V Superman would be sporting three designs that are as cohesive on their own as they would be existing in a single universe (and the pants would cease to be an issue). Of course, Diana's backstory must enter into the equation at some point, and as much as fans have already debated the film's likelihood of success, absolutely nothing is known about the origin story David S. Goyer, Christopher Nolan and Zack Snyder have crafted for her. 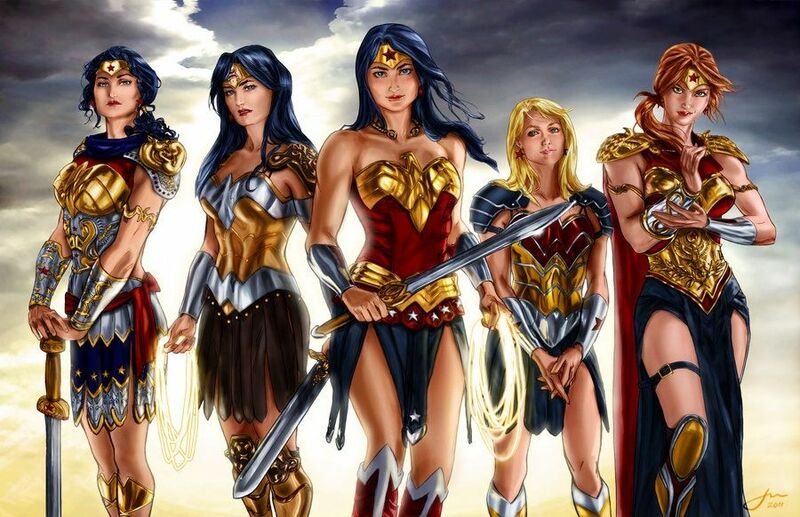 Some artistic liberties are to be expected, but if the classical mythology, architecture, and dress of the Amazons are going to be preserved, then it would seem leather and bronze are more likely than space-age fabrics. Luckily, not all fan-films help to highlight the problems with adapting a character like Wonder Woman. Yet another film which made the rounds featured a version of Diana seemingly pulled from the surreal Greece of Zack Snyder's 300. And if Snyder does choose to embrace ancient armor, he's got plenty of designs to choose from. Although the Batsuit crafted for Dawn of Justice is clearly the most faithful live-action adaptation of the comic book costume to date, it seems inevitable that Wonder Woman's outfit will have to be re-imagined on some level. But as mentioned before, a more accurate prediction won't be possible until some part of her character's backstory is at least hinted at. As for Superman, the admission that Henry Cavill's suit will be "tweaked" for the upcoming sequel took many by surprise. While the film's critics saw the statement as a sign that Snyder would give up the darker, more subdued and alien design of the Kryptonian underclothes, we're not so easily convinced. Some small improvements in costume are the norm for superhero sequels, and if Kal-El is going to be sharing screen time with both Wonder Woman and Batman (and Cyborg in the coming years), it's just as likely that the suit's CG cape has been ruled obsolete. Of course, there is also the possibility that the changes to the Super-suit bear a deeper significance than on-set logistics. Few comic book stories influenced Man of Steel's updating more than Mark Waid and Leinil Yu's "Superman Birthright," even adopting its idea of the signature 'S' embodying hope for all of Krypton. And in Waid's origin story, the superhero's costume was no accident, either. The decision to wear bright colors and a cape means subtlety is not the goal, and for "Birthright"s Kal-El, that was the entire point. As Waid put it, the main problem for Clark Kent wasn't keeping his powers a secret, but how terrified people would become once he revealed them. How could the public trust him if they came to realize he had been hiding among them, hearing their whispers, and seeing through them - literally? There was only one real solution, and that was to sport a suit that screamed anything but secrecy; with a caped suit of red, blue, and yellow, nobody could ever accuse him of trying to stay hidden. Since Kal-El managed to save the entire human race (at the cost of a city) in Man of Steel, that might not be as much of an issue in Snyder's movie universe. However, Batman has been rumored to wear multiple suits in Dawn of Justice, so it's possible Superman could sport a bright, bolder look by the film's conclusion. Strange images of a new Superman suit/mold/statue are already appearing online, so Snyder's plans are clearly still a mystery. More and more rumors are sure to surface over the coming months, but if the Ben Affleck Batsuit has taught us anything, it's that reports of comic book influences and hints are easier to make than some might assume. At one time, the costume from "Batman: Noel" was said to be a touchstone for the new costume; now that the suit has been revealed, it seems that the "Elseworlds" version of the suit is as recognizable in the design as just about any other - with Frank Miller's "Dark Knight Returns" the biggest influence, as stated. Just how close our predictions end up keeping to the actual re-designs, well... we'll just have to wait and see. Batman vs. Superman is scheduled for May 6, 2016.